expressive ASL translator Lydia Callis, Stewart thanked Hizzoner and New Jersey Gov. Chris Christie for punting major rump throughout the crisis. Theirs was a singular response to a singular event, free of the sort of political gamesmanship that can hobble a massive recovery effort. Also unprecedented was the media response. While millions of people still relied on traditional news sources, the place to turn for real-time information from the frontlines was Twitter. The dispatches you read here were ﬁled from various sanctuaries throughout New York, places where friends took us in or dumb luck kept the lights lit. For the ﬁrst time in its history, Adweek is publishing in its entirety from a remote location, our offices marooned in the dark of East 9th Street in Manhattan’s East Village. Following is our attempt to illuminate the events of last week. With an estimated 8.1 million TV viewers without power, following news of the storm became an exercise in battery preservation. Screens dimmed to save juice and people activated the Twitter app on their smartphones, listening for virtual voices raised against the howling of the storm. 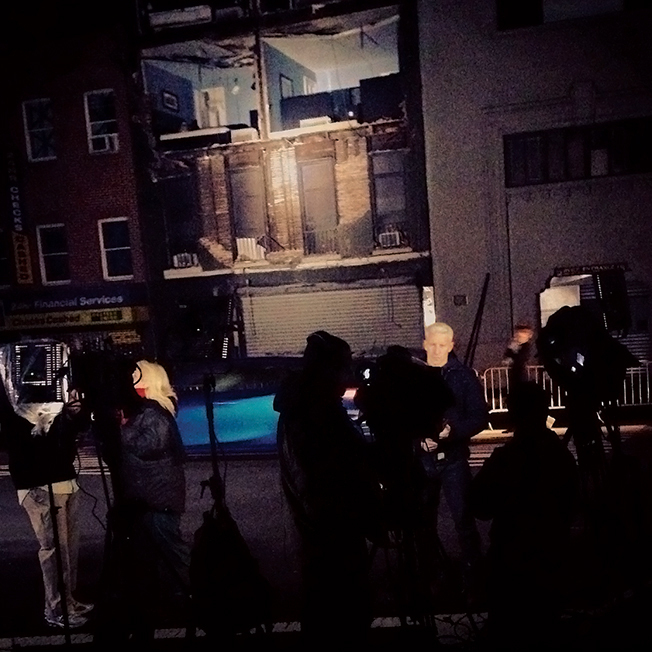 At its best, Twitter allowed those who were in the cone of destruction to share ﬁrsthand reports and photos. On Monday alone, the term “Sandy”. was mentioned 4.8 million times on Twitter, while Instagram played home to 10 photo uploads per second even before landfall. Some of the better pictures—like that of a carousel swallowed by the East River—were shared thousands of times via cable networks and local TV. Late Monday evening, New York’s 911 call center was so overwhelmed that an NYPD Twitter feed began serving as a conduit between ﬁrehouses and New Yorkers in crisis. There were also far less noble moments: Tweeting under the handle @ComfortablySmug, hedge fund manager Shashank Tripathi falsely claimed that the New York Stock Exchange had been ﬂooded. For all that, Twitter’s self-correcting mechanism kept the hijinks to a minimum. Much of the noise in the system was actually good for a laugh; it’s hard to imagine anyone naïve enough to be gulled by a photo of the Stay Puft Marshmallow Man and Godzilla joining forces on Liberty Island. The digital outposts of traditional TV platforms also scared up loads of trafﬁc. WeatherChannel.com had its best daily performance ever, landing 450 million page views across all digital platforms—125 million by mobile and tablet alone. ISP that serves prominent sites like BuzzFeed, Gawker Media and The Hufﬁngton Post, went dark as Sandy reached the height of her powers. Following BuzzFeed’s lead, Gawker set up emergency Tumblr accounts to satisfy the Web’s insatiable demand for content.